"Fruity and full of flavor. The best way to get the party rollin'!" 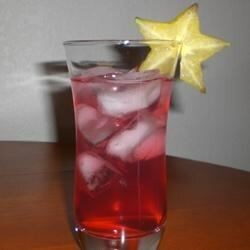 In a tall glass over ice, combine rum, lemon-lime soda and cranberry juice. Garnish with a slice of lime. This was pretty good, it seemed like it was missing something though. Maybe a splash of lemon juice? Pretty good although this is not an actual Double-O-7. The original cocktail contains orange vodka, orange juice, and 7Up (hence the name).